At a time when its armed forces are massively over-burdened, Paris is greatly reliant on its partners. But Germany is not ready to play the role France wants it to. When the German president, foreign minister, and defense minister gave speeches at the 2014 Munich Security conference—speeches now recognized as watershed moments in Germany security policy—hope began to blossom in France. Would German defense and security policy finally become “normal?” Many viewed the now widely cited speeches as the beginning of a process in which the Germans would have overcome their “culture of restraint” and establish themselves as a full-fledged defense and security ally. For some, it was also implicitly clear that a normalization of Berlin’s strategic defense culture would automatically mean more convergence with the French position. Of course, the French recognized that Germany would still need a bit more time, but they felt that France would soon get the partner it had desired for so long, who shared its ambitions and energetically supported them. Four years later, it is clear that this is not the case. This realization has not triggered any great debates—if anything, it has brought resignation. France is looking around for an alternative to Germany, but replacements are hard to find. Of course, this is not the official version of events. Statements from the Franco-German Council of Ministers and other bilaterals continue to praise the outstanding, close cooperation between the two countries. But despite France’s understanding for the historical reasons behind Germany’s aversion to militarization, the prevailing feelings are frustration and impatience, as recently demonstrated by the disagreements regarding PESCO and the European Intervention Initiative. In both cases, Germany had little interest in ensuring that Europe could quickly and effectively intervene militarily. In short: France feels abandoned by Germany in security and defense policy. And that despite immense challenges in the south. While Paris had made the fight against terrorism and instability (above all in Africa) a top priority even before the terrorist attacks in November 2015, the same wasn’t true for Berlin. True, Germany is also present in Mali in the context of UN and EU missions. However, behind the scenes in Paris, the French often complain that they must bear the brunt of stabilizing the Sahel region, which is one of the biggest challenges Europe faces. The situation was similar in 2011, when Germany abstained in the UN Security Council on the decisive resolution for intervention in Libya. The accusation that Germany is not engaging enough is a recurrent theme. German caution when it comes to military missions abroad is not seen as an expression of pacifism, but of naïveté and often as a lack of solidarity. At the same time, not everyone in France takes seriously the security and defense activities that Germany is engaged in. Critics complaint that the German preference for civilian crisis management is simply a tactic that lets them avoid the “hard” military tasks. And Germany’s involvement in collective alliance defense, primarily as a framework nation in the Enhanced Forward Presence of NATO, is sometimes seen an evasive maneuver in the face of—at least as some see it—a non-existent Russian threat: thanks to its role in Lithuania, critics say Berlin can show commitment without German soldiers needing to risk their lives in the actually dangerous operations in the south. However, French discontent is not always about whether soldiers in the Bundeswehr are involved in combat missions. The impression that Germany is not a reliable defense partner in Germany has its roots in, for example, the (not entirely unjustified) concern that shared capabilities might not be available in an emergency because the Germans have no parliamentary mandate for deployment. After all, France still remembers the highly critical stance Germany took towards nuclear weapons during Guido Westerwelle’s tenure as foreign minister (2009-2013). In a country whose security identity is based in no small measure on its status as a nuclear power, Germany’s position under Westerwelle was a source of embitterment. While the German attitude on nuclear weapons certainly has evolved since then, news of this change has not yet arrived everywhere in France. The fact that French strategic culture cannot simply be transferred to Germany is a fact acknowledged on both sides of the Rhine. The French frustration does not necessarily stem from the fact that Germany is different. Rather, it is ultimately the lack of a strong strategic culture in Germany and the low attention paid to defense issues in the German debate that bothers the French. Occasionally, Paris gets the feeling that Berlin has not recognized the seriousness of the current situation. Germany cannot hide behind its history indefinitely, but must instead learn to think strategically and geopolitically. Even the institutional and constitutional framework of German defense policy is sometimes considered problematic, the parliamentary reservation being the biggest nuisance. It is true that Germany and France could hardly be more different in terms of how military operations are approved. For example, the French President is empowered by the Constitution to order air strikes. He and must simply inform the Assemblée Nationale after the fact. In comparison, the German procedure appears both unwieldy and laborious. French experts followed with the great interest the work of the Rühe Commission, a 2015 Commission on the German parliament’s rights in troop deployment to foreign missions led by former defense minister Volker Rühe. Accordingly, they were greatly disappointed when its not-especially-ambitious recommendations failed to be implemented. 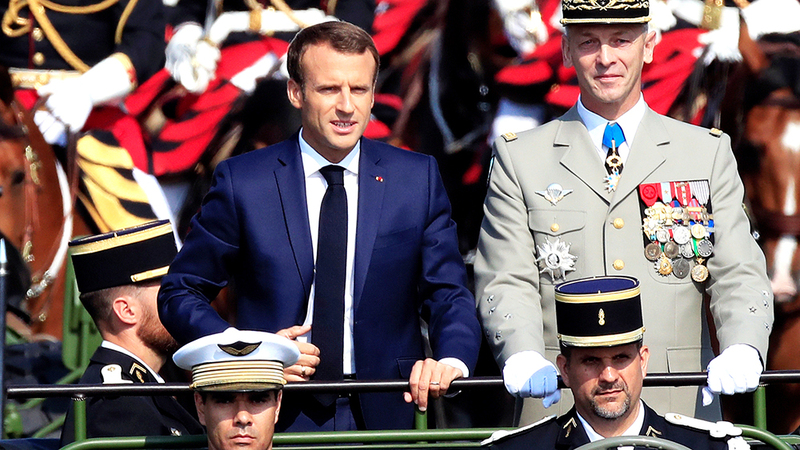 The French approach of concentrating power in the executive, however, also leads to misunderstandings—less so in diplomatic circles than in the wider public. For example, many people were convinced that, when Emmanuel Macron took office, all he had to do to persuade Merkel of the need for a more ambitious defense policy was show some French élan. But these hopes were dashed by Germany’s cautious reaction to Macron’s European Intervention Initiative, if not earlier. It is not clear to everyone in France that the German chancellor’s influence on defense policy, however powerful a leader he or she may be, cannot be compared to that of a French President. This also reveals that the French don’t always understand the strong role of the Bundestag. Last but not least, the French often underestimate the importance of public opinion in German security and defense policy. Public opinion is important in part because Germany gives the parliament more control of defense policy, but also because defense policy —including foreign missions—generally doesn’t give rise to much controversy in France. The cultural difference is particularly clear on a question that is a traditional stumbling block in the Franco-German relationship, one that will be increasingly important in light of new joint projects: armaments exports. Berlin’s strict interpretation of rules and regulations is a thorn in Paris’ side, and the German government’s announcement that it wants to be even more stringent in approving arms exports caused incomprehension and genuine discontent in Paris. As the two countries have loudly announced a number of joint projects (drones, tanks, combat aircrafts), there is great concern that the economically necessary export of jointly developed and built armaments could ultimately run into a Berlin blockade. Franco-German cooperation on armaments exports is a good example of the symbolic dimension of the bilateral relationship. Relations between the two countries have immense political significance, especially for Paris under President Macron. From a purely defense-policy perspective, however, Berlin was never the most desired partner. The United Kingdom appeared much more interesting: it is also a nuclear power and, thanks to a strategic culture similar to France’s, much less intervention-averse than Germany. Consequently, defense cooperation between Paris and London has always been more ambitious than between Paris and Berlin, as illustrated particularly well by the 2010 Lancaster House treaties for bilateral cooperation. As a result of Brexit and the election of Macron, Germany has now moved into the foreground again—but not everyone in defense circles is happy about that. For example, some people would have preferred to see the successor to the Dassault Rafale fighter aircrafts emerge from Franco-British cooperation, rather than from cooperation with Germany. The announced armaments projects are therefore also a symbol that EU politicians can win some battles against parts of the defense establishment. All of this, however, cannot hide the fact that the greatest French problem remains unaddressed: at a time when its own forces are massively overburdened, Paris is greatly reliant on its partners. Yet Germany still is not ready to play the role France wants it to. is a research fellow at the French Institute of International Relations (ifri).